• There is a new word floating around Twitter: "mong." As in, "mongoloid," a derogatory term that once referred to those with Down syndrome. Comedian Ricky Gervais is freely using it as a synonym for "misguided," "foolish" or "wrong." (Even more charmingly, he's posted photos of himself doing his impression of what he calls "monged-up poses.") Gervais has refused to apologize; his excuse is that he is not speaking to people with Down syndrome. Which is the same argument clueless/insensitive people use about the word retard. October is Down Syndrome Awareness Month; in honor of it, please tweet @rickygervais and share your thoughts. Update: Gervais spoke with British blogger Nicky Clark and apologized to those hurt by his tweets, although I'm unconvinced he really understood what was so wrong—and of course, there's no explaining the photos he posted. • October is also National Breast Cancer Awareness month, and lots of stores are offering discounts and donating a portion of sales to raise money for b.c. research. Retail Me Not has a good listing of merchants. 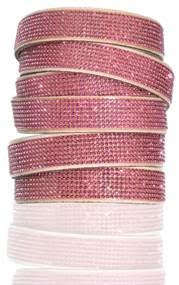 Oh, and I love this Swarovski Cystrallized bracelet, $58; a chunk of proceeds go to the American Breast Cancer Foundation. • Next week is the cleverly named National Lead Poisoning Prevention week. OK, seriously, lead poisoning is a real problem; nearly a quarter of a million children living in the U.S. have blood levels high enough to cause serious damage to their health. Major sources of exposure include lead-based paint and lead-contimainted dust. If your home was built before 1978, assume that the paint has lead. On the upside, lead poisoning is preventable; check out these tips from the Centers For Disease Control and Prevention. 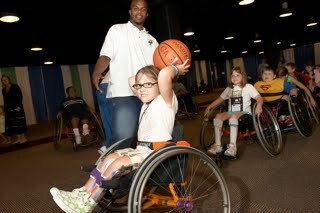 • October is also Spina Bifida Awareness Month (what is it with October?! ), and the Spina Bifida Association (SBA) is holding a Celebrate SB Photo Contest, created to acknowledge accomplishments of people in the community. The winner will receive a $100 American Express gift card and have their photo and story featured in the SBA's national mag. • Duo Games will donate $1 to the Make-A-Wish Foundation for every "Like" on their Facebook page all throughout October, up to $10,000, and their also giving away prizes for every 500th "like." • I am planning to feature moms who sell handmade stuff to pay for their children's therapies. Email me if you're interested in being included, or tell moms you know who fit the bill to get in touch. 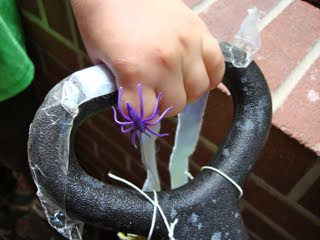 Prepare kids early on to help them get comfortable with Halloween. Take them to a Halloween store and let them dress up, or create a picture story and read it together to help feel them out for what's on their mind. * Practice dressing up and trick-or-treating around the house. Act out scenarios, like if someone asks "What are you dressed up as?" * Do a dress rehearsal. Walk around the neighborhood and choose the homes you are going to visit; tell neighbor what to expect and approach your child. Give a wide berth to homes with too-spooky decorations or blinking lights. Word: Try not be disappointed if your child refuses to dress up, as I learned one year. Whatever makes Halloween fun for your child is a good Halloween. The Ricky Gervais thing is playing out over here too as you can imagine. He doesn't have the same image problems over here as he does in the States but what he said is broadly condemned. He argues that it has always been a part of his act and that he doesn't use the word maliciously. There is also a strong argument by the comedy world that the whole freedom of speech thing is important. But when it comes down it, it's name calling for comedy effect and it's riding on the back of a negative image of disability. However he may try to justify what he does, it's just wrong. It's sad when people use offensive terms like this when trying to be funny, or to "make a point" ... I always try to say something when people around me use the R-word. Even my girlfriend has picked up on it too! 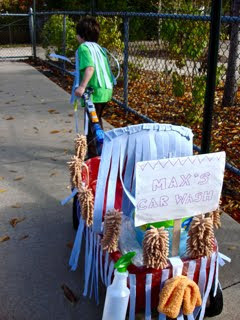 As far as Halloween goes, is Max's Car Wash part of his costume? It looks cool! Regarding Ricky Gervais: There is a reason people choose to continue to use these socially charged words. And it's precisely because they are such lightning-rods, and deeply divisive. Sure he could say: slow, stupid, dumb, foolish. But none of those pack quite the same push, now do they? For people to convince themselves that they choose these words for any other reason is insulting beyond belief. We see beyond the lame excuses and justifications, and we will not stand for it. Who's looking foolish now Mr. Gervais? October is also national dwarfism awareness month! Dwarfs, including me, get offended by the term midget. We would prefer with dwarfism, lp, little person, or even the medical term of dwarf, but, like everyone else, we prefer our name! Have a great day! I have no doubt Gervais, if anything, believes he is doing a service by making people with downs "the same as everyone else", by including them in his "good natured" slandering. I used to enjoy his sharp wit and self deprecating style. But then I realized how dismissive he is of anyone's beliefs, fears or concerns if they are not the same add his own. He has to resort to making light of people, instead of respecting different ways of understanding. For me this is the sure sign of a person with confidence issues. What is it with these celebrities anyway? This is beyond annoying. It's getting to the point where I wish these people would simply keep their mouths shut. Whatever happened to "If you don't have anything nice to say, don't say anything at all" ?? They might not intend to offend, but they do. October is a fun month for lotsa stuff--eat pizza, brush your teeth!! Look what I found at wikipedia!!! Who knew the tenth month was so...busy?